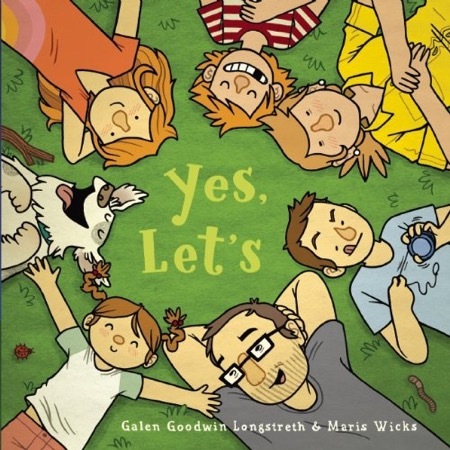 In this wonderful picture book, each page is a complete illustration, with a rhyming caption over top describing how this large family — parents, four kids, large dog — decides to spend a day in the country, hiking in the woods, having a picnic, swimming in the river. It’s a terrific paean to enjoying the outdoors and being part of such a family. The art is amazing, too, with such active participants who obviously care about each other, and such detail! Readers will spend a lot of time poring over each picture, finding all the surprises around the edges and following the various characters. Even though they’re unnamed, they each have their own personality and attitude. My favorite images are the evening ones, as the light fades and the family has to wrap up and head for home. The colors are so true to twilight. I found this book so refreshing, I will read it over and over. Give it to your favorite young one, especially if they’re heading out to camp.